There is one reigning champion left in the Champions League: Cristiano Ronaldo. But Ronaldo remains, he always does, surviving a scare in the last round that required him to score a spellbinding hat-trick to overturn a two-goal deficit against Atletico Madrid. There is irony, then, in it being Ajax he must now dispose of here in Turin on Tuesday evening. Should he prove the difference yet again – he scored during last week’s 1-1 draw in Amsterdam – then the suits inside the Bernabeu will be left counting the cost of his absence, and not the £99.2million they banked as compensation for his loss. 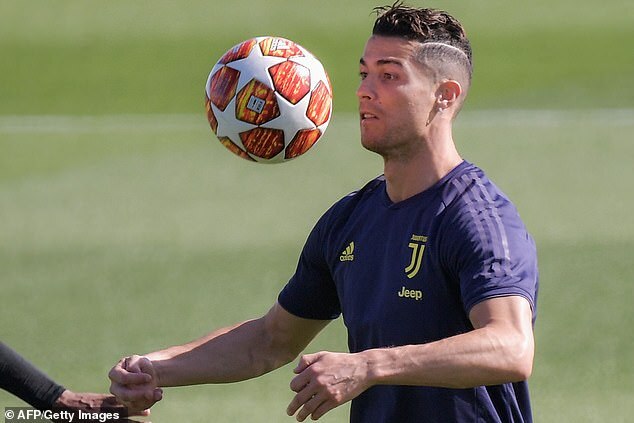 For Juventus, the expenditure will be worth every cent if Ronaldo is to return a first Champions League victory in 23 years. And that is why they bought the Portuguese superstar. Not to win Serie A. They can do that without him, as they have demonstrated for the past seven seasons. 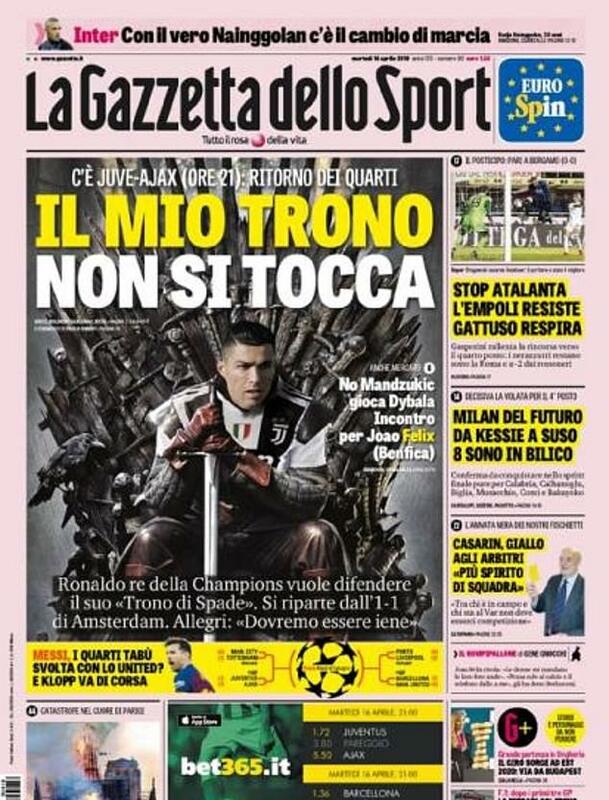 Gazzetta dello Sport does not splash Ronaldo on its iconic exterior mocked up as a character from Game of Thrones for a league fixture. But they have done on Tuesday. There he sits, sword and all, resting beneath the headline, ‘Il mio trono no si tocca’. Translation: My throne cannot be touched. His intervention against Atletico was certainly that of a man not ready to relinquish his crown. Walk into a tabaccheria in a suburb near the Juventus Stadium and a giant image of Ronaldo smiles back at you. It is not for sale, it is simply a cherished possession of the owner, much like Ronaldo now is of Turin. The intensity of the obsession has not yet scaled the heights of Naples and Diego Maradona, but should he be the inspiration behind a third European title, then the eternal love of the Old Lady awaits for their old master. For at 34 he is supposed to be slowing down, and a rising wage coupled with a rising age was a factor in Real’s decision to let him go. But Ronaldo continues to defy the expectation of nature. They say that age is just a number, yet his numbers are far more significant, proof that his time at the very top is far from over. He has 25 goals from 37 appearances for Juventus, which is down on his goal-a-game ratio for Real. But consider that he has eight from his last eight and you wonder if he has in fact saved a little for the business end of the campaign. 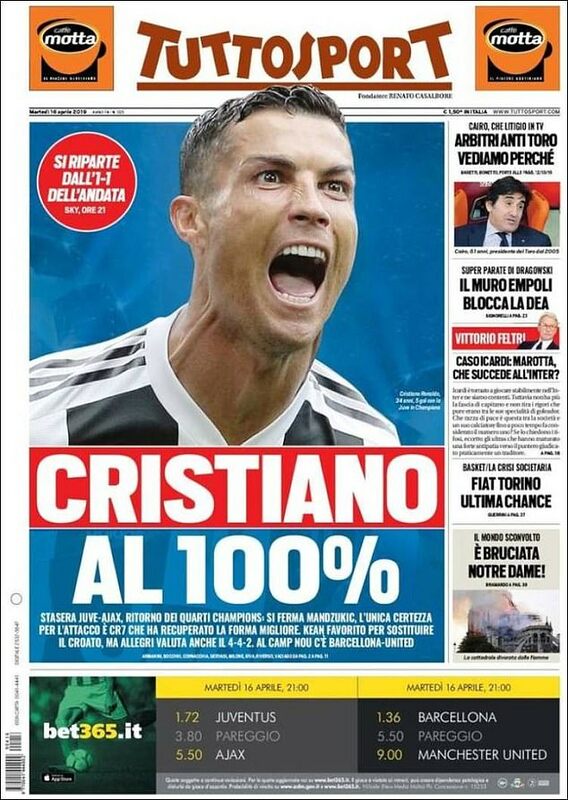 After all, he does not need to be at full tilt to conquer Italy. 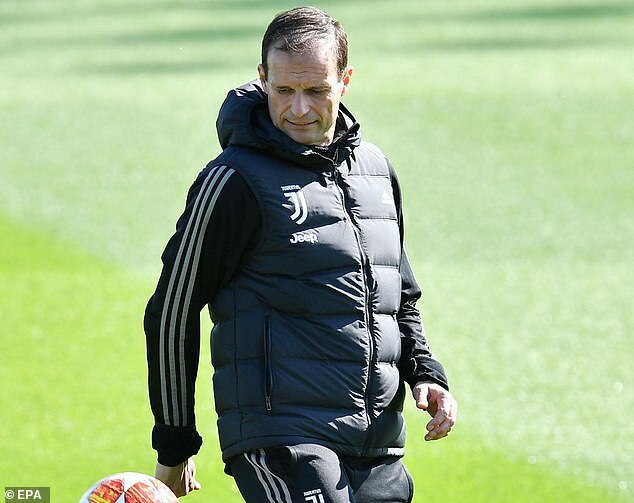 That is not the case in Europe, as he will discover against an Ajax side that rank as the club’s best since the mid-Nineties, when they lifted the Champions League in 1995 only to be beaten by Juventus in the following year’s final and again at the semi-final stage 12 months later. In Barcelona-bound Frenkie de Jong and captain Matthijs de Ligt – 21 and 19 respectively – they have two of Europe’s most exciting prospects. Win and they will be back in the last four of this competition for the first time since that loss to Juventus 22 years ago. De Jong and De Light, it should be noted, were not yet born when a team including the likes of Marc Overmars and Edwin van der Sar were beaten 6-2 over two legs. This, then, is very much a new generation. Sadly, however, it is one which, given its talents, will be broken up as quickly as it has emerged. Longevity and Ajax are no longer compatible. The same cannot be said of Ronaldo and success. He is the enduring emblem of triumph. Just ask his old pals at Real Madrid.